The Apple Isle. The Natural State. The Island of Inspiration. Tasmania has been given many nicknames over the years, but it has recently earned itself a new one. Welcome to the Whisky Island. From 1839 until 1992 it was illegal to distil whisky in Tasmania. But in the 22 years since Governor John Franklin's law was overturned, the island has become home to almost half of Australia's distilleries, and many of those are already producing world-class whiskies. Earlier this year Sullivan's Cove French Oak Cask became the first Tasmanian whisky to be named Best Single Malt at the World Whisky Awards in London, and around the same time Lark Distillery won Best World Whisky at the International Whisky Awards in Chicago. It is at Lark’s Cellar Door in Hobart where I meet Mark Nicholson, a former English teacher who now spends his days driving the ‘Drambulance’ – a minibus that takes visitors out to the Lark Distillery complex in the Coal River Valley. Mark is a ruddy-faced, smiling man with a big beard. He tells me that he likes to put the right words in the right order to help tell the story of Tasmania’s whisky industry. In 1992, Bill Lark was trout fishing with his father-in-law in the highlands of Tasmania. The two men took a break from their sporting pursuits in order to have a wee dram of single malt, and as Bill looked around he realised that the peat bogs, the clean water and the climate of Tasmania made for a perfect whisky-making place. Not long after, when he submitted an application to start distilling on a small scale, he was informed that a 150-year-old law banning that was still in place. But after a local representative applied a little pressure in Canberra, the law was overturned. Bill and Lyn began making whisky at home with a tiny 20-litre still, before moving on to a 500 litre commercial still that their daughter had to squeeze past in the hallway in order to get to school. These days, Lark produces 600 litres of spirit a week, or around 30,000 litres a year. Compared to most distilleries in Scotland or Japan, this is still a tiny amount, but, as Mark says, they are trying to compete in terms of quality, not quantity. They are well placed to do that. 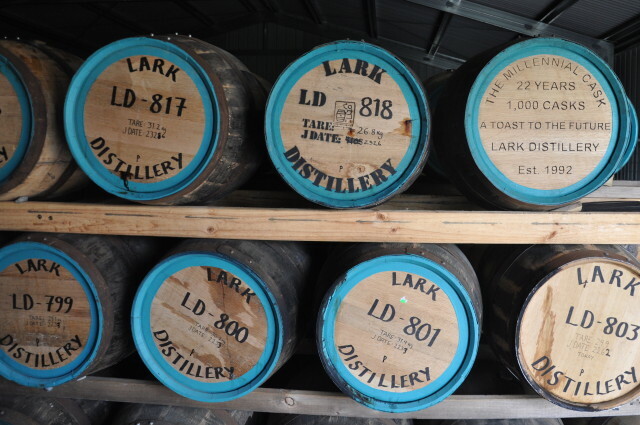 Lark is the only distillery in Australia to own its own peat bog, which they use to smoke their barley. They use quarter casks – smaller barrels that cost more as an initial outlay, but lead to more oak contact, and a rapid and robust maturation. They only do single cask releases – no blends – and, admirably, they have made a commitment to always prioritise the local market. In a way, Tasmanian whisky is the victim of its own success – the marketing and award success has in some cases outstripped the capacity for production, and there are a number of products that are now virtually impossible to buy. But as Mark says, there’s no point having Lark available to drink across the United States if Tasmanians can’t drink it here. As we climb into the Drambulance and head out to the Coal River Valley, Mark describes the whisky industry – both locally and globally – as a warm and welcoming one. When John Grant from Glenfarclas heard about Bill and Lyn’s successful licence application back in 1992, he apparently phoned and woke them up in the middle of the night to offer all the help he could. Bill himself no longer has a hands-on role in the production of Lark whisky – he is instead a global ambassador for the brand, and spends much of his time travelling – but he has been an advisor or consultant to almost every other distillery on the island. There have been joint ventures such as the plinth, a wooden display found in local bottleshops that allows the four biggest distilleries to joint promote, and there is now both a Tasmanian Whisky Tour, and a Tasmanian Whisky Trail, which Mark describes as a ‘work in progress’. Lark itself has only recently made the move from a family business to a corporate structure. It is a time of adjustment for everyone involved, but so far it seems to be paying off, and last month they won the 2014 Australian Small Business of the year. As a visitor, you would not know that operations have become more formalised. Everything about Lark still holds a personal touch. Mark knows every pothole to steer around on the driveway down to the distillery, and he laughs as he points out the forklift truck they use for shifting boxes around the complex – it is a Clark one, with the letter C in the logo painted out. When we head into the building there is a photographer there from Vogue, and Head Distiller Chris Thomson is being teased by other staff about the white t-shirt he has changed into for the shoot – so new that it still has creases in it from the packet. Mark gives an excellent tour of the Lark production line. He talks about the blend of yeasts they use, extending the fermentation time from the standard three days to seven in order to improve the flavour. He talks about the characteristics of the barley they use, its oiliness, the fact that it produces less alcohol but more taste. He lifts a glass and talks about the scents of butterscotch, of maple, of candied orange. But it’s when I ask about Lark’s typical customers that Mark’s eyes really light up. Surely, I say, with such a quality product, there must be people buying bottles and barrels of Lark and laying it down for the future. Ruth Dawkins is a writer, editor and campaigner, originally from Scotland but now living in Tasmania with her husband and son. She is a columnist for The Island Review, and will be contributing to the site regularly.